There's a new operating system on the horizon, and this one's so big that it may actually live up to its galactic moniker. Andromeda, a merging of Android and Chrome OS, has the potential to bring Google to the ubiquitous status that Microsoft's Windows enjoyed in the '80s and '90s. Unlike Microsoft, though, Google's main business is not in operating systems. Instead, Google makes its money selling ads, and the bulk of that cash comes directly from their own umbrella of services and websites. Ads displayed in YouTube videos, Search, Gmail, Google Maps, and other Google services accounted for 77% of the company's ad revenue in 2015. However, Google's competitors are well aware of the Mountain View company's formula for success, and they're not sitting idly by. Apple switched the iPhone's default search engine over to Bing a few years ago, Microsoft's Cortana uses the same backbone, and both companies preinstall apps on their devices that are in direct competition with Google—all at least partially driven by a desire to divert users away from Google's services. This is likely the real reason that Google even bothers to make operating systems: To ensure that they can't be locked out of users' devices by other companies. For laptops, a market traditionally dominated by Apple and Microsoft, Google has Chrome OS. The operating system has carved out a successful niche for itself by powering a range of low-cost laptops known as Chromebooks, which actually overtook Mac shipments in the US by about one percent in the first quarter of 2016. Still, it's a relatively low number of shipments compared to Windows-powered PCs. But there's one hugely successful operating system made by Google, and that's Android. It's installed on 86.2% of all smartphones worldwide, and has even surpassed Windows to become the single most common OS for any platform. And while the OS is commonplace, small screens on smartphones aren't ideal for media consumption, and Android doesn't perform nearly as well in terms of market share in the tablet segment. 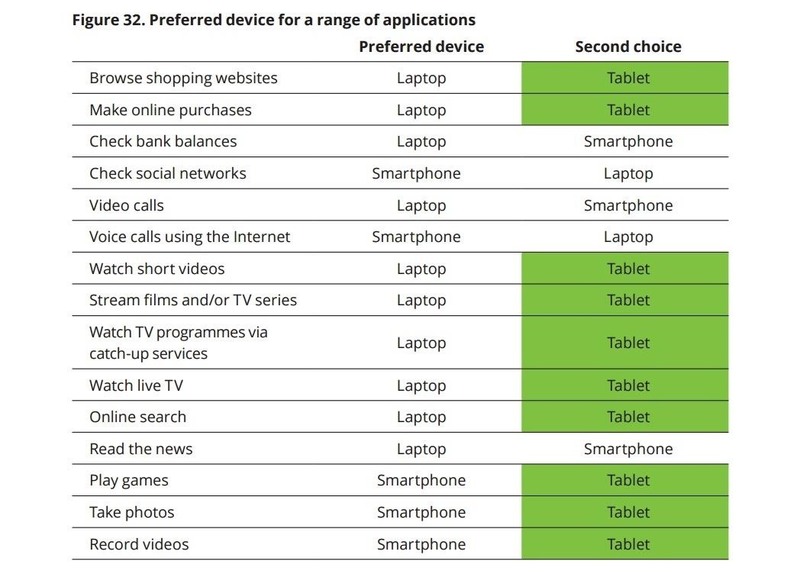 These two points are crucial, especially when you look at the following table from a recent Deloitte report on the UK smartphone market. Most mobile users prefer a laptop or tablet for consuming media of all types, making online purchases, and even performing web searches—Google's bread and butter when it comes to ad revenue. Considering laptops and tablets are the two areas where Google's various operating systems have had the least success, it's of utmost importance that Google finds a way to truly break into the laptop and tablet markets with an OS that puts Google's services (and thus, ads) front and center. Google's upcoming operating system is more than just a portmanteau of Android and Chrome—it's a self-preservation measure. Merging their popular smartphone operating system with an interface designed for bigger screens signals that Google realizes its tablet and laptop offerings need an injection of new life. With Android's current dominance in the global smartphone market, it may seem like a bad move to mess with success. But Andromeda isn't about Android, because this move is not about smartphones at all—it's about tablets, laptops, and the ad revenue they generate. Google's motives are clear here, but when it comes to Andromeda, a lot of the details remain to be seen. If you're interested in learning more about the new OS, including how it fits in with Android, you can read more at our full Andromeda explainer below.